How to Drink Apple Cider Vinegar for Better Health? Apple cider vinegar, also known as cider vinegar and ACV, is made by adding yeast and bacteria to apple juice. ACV is a fermented drink and, like vinegar, is high in acetic acid content, which gives it an extremely sour taste. Here, we take a look at various health benefits of ACV and how to drink apple cider vinegar, a drink that scores well on the health aspect. A number of studies have been conducted to find out the health benefits of having ACV. Acetic acid, which is the main ingredient of ACV, helps normalize the blood glucose levels and insulin responses. If you feel full after having a certain type of food, you tend to eat less of the other available items and this is key to reduce weight. Weight watchers have plenty to “gain” from this wonderful drink. To ACV, you can add some interesting ingredients to make a healthful drink that helps keep your weight in check along with a few other health benefits. Here are some quick recipes to show you how to drink apple cider vinegar the right way. ACV and water make a healthy and refreshing drink to have before going to bed. An hour before you go to bed, mix a tablespoon of ACV with a glass of water (around 300 ml) and drink this to wash away the toxins and keep your blood glucose under control. Having ACV with other juices like grapefruit juice helps regulate its sour taste and makes it an ideal drink to wash down your breakfast. Mixing a cup of this juice with two tablespoons of ACV will make a tasty drink. When choosing a juice, you can experiment with other fruits of your choice and preferred flavor. Since ACV is sour, the taste should be disguised well with the juice you choose so that it becomes drinkable. A pro tip here is to go with juices that are high in vitamin C to give you some additional health benefits. Take one tablespoon each of raw honey and raw apple cider vinegar, and one full cup of water. Mix all the ingredients in a glass and stir the mixture to make it homogeneous, and that’s it. Have it at least 20 minutes before you have your breakfast. These recipes are pretty simple and easy to follow, actually. Just be consistent in drinking it every morning or night, whatever suits you well. Some people might need to add more water in case the sour taste remains or there is difficulty swallowing this drink. Separate research studies conducted in Algeria and Japan indicate that ACV helps some lose and/or maintain weight. A preliminary study conducted on rats at the University of Oran in Algeria indicated a reduction in the metabolic disorders due to a high-fat diet and that it has a satiating effect on the body. Another study conducted on humans at the Central Research Institute in Japan showed a reduction in BMI, waist circumference, and serum triglyceride levels of a few obese people who were part of the study. The study indicates that daily consumption of ACV could reduce obesity and the risk of metabolic syndrome. Having ACV every morning on an empty stomach is known to be a wonder drink. ACV contains some pectin and has a good amount of manganese; trace amounts of other minerals like sodium, phosphorus, potassium, calcium, iron, and magnesium are also present. Apple cider vinegar has significant quantities of acetic acid. It’s important to drink diluted ACV on an empty stomach. This drink is so versatile that it can give you a number of health benefits when consumed before or after a meal; even before calling it a day. So how do you consume it? ACV is a sour, fermented drink and it is advisable to dilute it in another juice or water with natural honey as a sweetener. In a glass (250 ml) of warm water, add two tablespoons of ACV. Stir well and add honey for sweetness. Have this at least an hour before you go to bed. This may especially help those with high blood sugar levels as the studies mentioned indicate. According to a study conducted on rats at the Central Research Institute in Japan, acetic acid was found to reduce blood pressure and renin activity. Plasma enzyme renin helps control the blood pressure. The study suggests that acetic acid in vinegar may lead to the antihypertensive effect. This area requires further research. A collaborative study conducted in Turkey indicated that topical application of ACV along with the conventional treatment greatly reduced the symptoms of varicosity and the pain and anxiety of such patients. Diabetic patients are those who benefit the most. Type 2 diabetes patients are known to favor this inexpensive drink as it has been noted to reduce waking blood glucose levels. A study conducted at Arizona State University found that fasting glucose levels for those participants who were given a vinegar dosage of two tablespoons along with cheese had reduced by about six percent. Though this study was helpful in pointing out the benefits to diabetics, the sample size was not large enough to generalize this finding and more research needs to go into this subject. But it is also a fact that those who had ACV daily before bed, with a glass of water or with cheese, were seen to have a lowered blood sugar level in the morning. However, in another pilot study conducted at Lund University in Sweden, it was found that type I diabetes patients have delayed gastric emptying due to the intake of ACV. This may reduce their blood sugar and insulin levels drastically. Hence people with type I diabetes who consume ACV may have disturbed glycemic control. This may require more research. 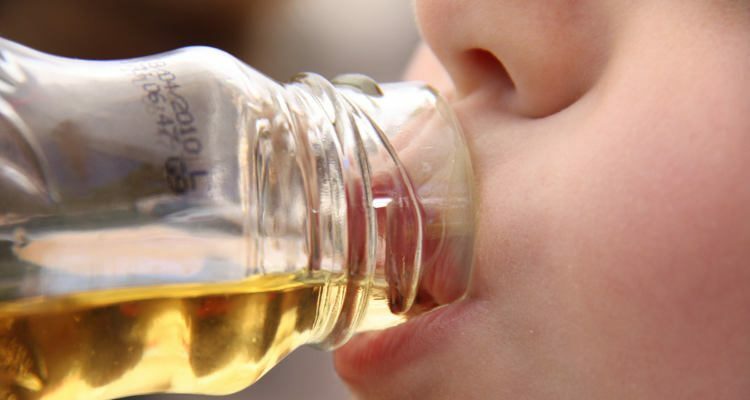 Drinking Apple Cider Vinegar Straight: Is it Safe or Harmful? Being a fermented drink and of a highly acidic nature, it is definitely not advisable to drink apple cider vinegar straight, or without dilution. It might be too acidic for the esophagus to handle and it will end up doing more harm than good. It is certainly not recommended to drink two tablespoons of ACV without dilution. In fact, when ACV is consumed as suggested with water or juice, some people may feel acidic or uneasy in the beginning. But these are supposed to be good reactions as it means that your body is reacting well to ACV and you should continue taking it for at least six to eight weeks to see significant health improvements. The highly acidic nature of ACV is also known to damage the tooth enamel and the soft tissues inside the throat if taken without dilution. Most people find this remedy simple and helpful to resolve their digestion issues, obesity, as well as other health issues. Knowing how to drink apple cider vinegar on an empty stomach in the morning, before a meal, or before bedtime offers many health benefits if taken according to the recommended dosage. However, in case of any symptoms you notice that last for more than two days, consult your doctor. Also, if you are on certain medications, have certain health issues, or are pregnant, then it is advisable to consult your doctor beforehand. This is because this drink is still under research, and although it’s been known for centuries, much is yet to be explored. While it may or may not be risky to consume ACV under these conditions, it is better to be safe.